To Cite: Mortazavi F, Mousavi S A, Chaman R, Wambach K A, Mortazavi S S, et al. Breastfeeding Practices During the First Month Postpartum and Associated Factors: Impact on Breastfeeding Survival, Iran Red Crescent Med J. 2015 ; 17(4):e27814. doi: 10.5812/ircmj.17(4)2015.27814. Background: The introduction of fluids to infants during the first days postpartum, which may be harmful to infant health, is a common practice in Iran. Objectives: This study aimed to find the prevalence of breastfeeding practices using monthly dietary recall and factors associated with introduction of fluids during the first month of life and determine the effects of these supplementations on breastfeeding survival. Patients and Methods: This longitudinal study carried out in Shahroud, Iran from May 2011 to October 2013. Using convenient sampling strategy, 358 mothers in their third trimester of pregnancy were enrolled in the study and completed the questionnaires. Then the data regarding the introduction of fluids during first month postpartum was collected. We followed women monthly up to breastfeeding cessation. 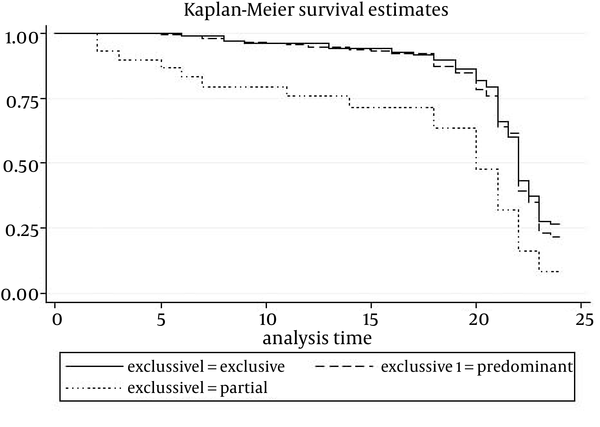 Kaplan-Meier and time-to-event methods were used to assess breastfeeding survival. A multinomial logistic regression analysis was used to identify the variables that determined breastfeeding practices at the first month postpartum. The Cox regression analysis was used to estimate the effect of variables on breastfeeding survival. Results: The prevalence of exclusive, predominant, and partial breastfeeding during the first month postpartum were 33.1%, 58.2%, and 8.6%, respectively. Predominant breastfeeding was associated with the lack of breastfeeding experience (OR = 1.93; 95% CI [1.02 - 3.66]). Partial breastfeeding was associated with the maternal age ≥ 30 y (OR = 5.96; CI [1.66 - 21.37]), family income higher than the mean (OR = 3.39; 95% CI [1.17 - 9.81]), and breastfeeding difficulties score higher than mean (OR = 3.09; 95% CI [1.10 - 8.71]). The Cox regression analysis revealed that breastfeeding practices at the first month was associated with an increased risk for breastfeeding discontinuation. The hazard ratio of breastfeeding discontinuation for predominant and partial breastfeeding groups were 1.11 (95% CI: 0.82, 1.51; P = 0.49) and 2.23 (95% CI: 1.39, 3.58; P = 0.001), respectively compared to the exclusive group. Conclusions: The prevalence of predominant breastfeeding during the first month postpartum is high in Shahroud. Interventions to strengthen adherence to WHO guidelines for breastfeeding should be considered. Breastfeeding education providers at the hospitals should emphasize the effects of formula on breastfeeding continuation at early postpartum. A number of breastfeeding health benefits for babies and mothers have been reported (1). Breastfeeding protects infants against diarrhea and respiratory tract infections. These effects may be decreased due to supplementation with water-based fluids or formula (2-4). In addition, the early supplementation may decrease milk production due to less frequent breastfeeding. As a result, breastfeeding difficulties may develop, which is contributed to reduced maternal breastfeeding confidence (5). The benefits of breastfeeding increased when the baby was fed with breast milk exclusively (6). Exclusive breastfeeding has been recommended for the first six months of life by all health organizations to achieve optimal growth and development (7). The establishment of the National Committee of Breastfeeding Promotion at the Ministry of Health in Iran in 1991 has led to the promotion of breastfeeding (8). To promote breastfeeding, many measures were taken such as establishing baby friendly hospitals, rooming in, prohibition of formula in neonatal wards, breastfeeding education for mothers in prenatal care and early postpartum care, monitoring of breastfeeding during the first two years, providing breastfeeding education programs for all health care personnel, and maternity leave of 6 months with pay (9). The results of a study indicated that the rate of any breastfeeding in the country during one and two-years of age rose to 90% and 57%, respectively (9). Although Iran has a high rate of breastfeeding initiation and continuation, its rate of Exclusive Breastfeeding (EBF) is decreasing. The rates of EBF at sixth months of age were 44% in 2000, 27% in 2004, and 23% in 2010 (10). The results of a systematic review showed that addition of other fluids or foods before 6 months is common in many countries (5). A previous study in Iran using a 24-hour recall indicated that a significant number of Kermanian mothers provided supplementation with fluids (37%) or formula (61%) in the first month postpartum (11). In another Iranian study, the exclusive breast-feeding rate in the first five days of life was 82%, but it declined to 44% at the first month (12). In addition, studies on the effects of supplementation on breastfeeding duration were inconsistent. A Brazilian study showed that these practices at the first month postpartum could affect breastfeeding duration at 6 months postpartum (13), while a randomized clinical trial claimed that infants who received limited formula at the hospital were more likely to be breastfed at 3 months and less likely to be breastfed partially at 1 week (14). However, results of a systematic review could not find any benefits of this practice on breastfeeding duration and rate of exclusive breastfeeding (15). Most studies in Iran assessing breastfeeding patterns were cross sectional or used a 24-hour recall, which overestimated the EBF rate. To our knowledge, there have been no studies investigating either the determinants of the early introduction of water-based fluids and formula or the effect of these practices on breastfeeding survival in Iran. In the present study, we investigated the prevalence of breastfeeding practices using monthly dietary recall and the associated factors of these practices that influenced the rate of exclusive breastfeeding. In addition, we aimed to examine the effect of breastfeeding practices at the first month of life on breastfeeding survival at 2 years postpartum in a sample of mothers in Shahroud City. We also considered the known predictors of breastfeeding continuation such as maternal psychological states and breastfeeding difficulties. This was a longitudinal study in which mothers were enrolled from 10 urban healthcare centers affiliated with Shahroud University of Medical Sciences, a city located in northeast of Iran. The healthcare centers were governmental and free for all mothers registered during pregnancy to receive prenatal and postnatal cares. The midwives in the centers also monitored breastfeeding continuation and infants’ growth. The Research Center and Ethics Committee at Shahroud University of Medical Sciences approved the study protocol (approval No: 900.02). The study started in May 2011 and ended in October 2013. Inclusion criteria were as follows: living in Shahroud, singleton pregnancy, gestational age > 28 weeks, and having decided to breastfeed. Exclusion criteria were infant birth weight less than 2500 g and major infant malformations. Of 390 eligible mothers, 32 mothers refused to participate. Thus, 358 mothers participated in the study and signed an informed consent form. The method of sampling was convenient. All pregnant women at the third trimester registered at health centers and consented to participate in the study were enrolled. There were 10 urban health centers affiliated to Shahroud University of Medical Sciences, which covered the entire city. According to the number of pregnant women registered at each center, we enrolled 30 to 40 pregnant women from each center. Mothers were followed monthly during the first 24 months postpartum or until cessation of breastfeeding by our call. Mothers who discontinued breastfeeding in the first 15 days of a month were considered as breastfeeding discontinuation at the beginning of that month. If mothers discontinued breastfeeding in the last 15 days of a month, we considered breastfeeding discontinuation at the last day of that month. To determine breastfeeding duration, we calculated the number of months between birthdays and the last time that the infants received breast milk. We managed to follow 347 mothers until the end of 6 months postpartum. Sixty-two mothers were not available during the first 2 years of life (dropout rate = 17.9%). The following parameters were considered to determine the sample size: power of 80%, 95% confidence level, one-month predominant breastfeeding prevalence rate of 37%, one-month partial breastfeeding prevalence rate of 61% (11), and odds ratio of 2. Based on WHO definitions for breastfeeding practices, infants who received breast milk without any other liquids or semi-solid foods were considered exclusively breastfed. Infants who received water-based fluids, including water, juices, sugar water, and herbal teas in addition to breast milk were considered predominantly breastfed (7). Infants who received formula in addition to breast milk were considered partially breastfed (16). Pregnant women completed a 2-part questionnaire, including sociodemographic and obstetric information and the General Health Questionnaire (GHQ-28) in the third trimester and 2 months postpartum. We interviewed mothers at the end of first month postpartum to collect information related to infant diets. To minimize the probability of recall bias as well as observer bias, we provided a list of common fluids, and asked them to choose among them. The list was provided by the help of midwives working in the centers. In addition, we trained midwives before the beginning of the study. To minimize the follow-up loss, we asked the midwives to get 3 cell-phone numbers from each mother. We assessed breastfeeding continuation monthly up to cessation. Women filled out the Breastfeeding Experience Scale at the first month postpartum. The 28-item General Health Questionnaire (GHQ-28) was developed to screen psychological problems (17). It included 4 subscales: somatic symptoms, anxiety and insomnia, social dysfunction, and severe depression. Each subscale was scored on a 4-point Likert scale ranging from 0 to 3. The total score ranged from 0 to 84, with a higher score indicating lower psychological well-being. It has been validated in Iranian population and the cut-off point for screening psychological problems has been calculated at 24 (18). The Breastfeeding Experience Scale (BES) consisted of 30 items and developed to measure breastfeeding experience and outcomes (19). The first 18 items of the instrument measure the severity of common breastfeeding difficulties in the early postpartum period using a 5‐point numerical rating scale (1 = not at all, 5 = unbearable). The total score ranged from 18 to 90, with a higher score representing increased problem severity. Content validity and internal consistency of this scale (Cronbach α coefficient = 0.76) were supported during the development of the BES. In a study on 31 mothers with mastitis, the α-coefficient for the 18 items was 0.81 (20). The scale included 5 subscales as follows: breast concerns; process concerns, milk insufficiency concerns, mechanic concerns, and social concerns (19). The scale was translated into Farsi and validated. The Farsi version of the BES included 5 factors as follows: process concerns, milk insufficiency concerns, breast concerns, baby problems, and mother problems. Two subscales were different from the original version of the BES. These 5 factors explained 58.6% of variances. The Cronbach α coefficient for the scale was 0.82 (21). Statistical analyses were performed using SPSS version 18 (SPSS Inc., Chicago, IL, USA). We substitute the individual’s mean score of the BES and GHQ-28 for the missing items of these scales. Descriptive tests were used to describe the sample characteristics. We used univariate multinomial logistic regression analyses to identify variables that predicted breastfeeding practices at the end of the first month postpartum. To control for confounding factors, the variables that were related to the outcome with P < 0.3 were further evaluated in the multivariate multinomial logistic regression analysis with stepwise forward (Wald) method to identify variables independently associated with the outcomes. The final model included variables presenting a significance of P < 0.05. We specified the probability for either entry or removal from the model. A variable was entered if the significance level of its F to enter was less than 0.05, and it was removed if the significance level was greater than 0.1. The multivariate Cox proportional hazards regression analysis was used to estimate adjusted hazard ratios and 95% confidence intervals of breastfeeding discontinuation, adjusting for variables with P < 0.3 in univariate Cox regression analyses. Kaplan-Meier and time-to-event methods were used to assess breastfeeding survival and to plot the breastfeeding survival curves according to the breastfeeding practices (exclusive, predominant, and partial) at the end of the first month of newborn life. The curves were compared using the log-rank test. The mean age and years of education of women were 26.1 and 11 y, respectively. All were married and 28% of women described their previous breastfeeding experience as excellent or good and 4.5% as moderate. The women’s demographic characteristics are presented in Table 1. Thirty-five point two percent of mothers received no guidance on breastfeeding. All mothers gave birth in two infant friendly hospitals in Shahroud where rooming in after birth was established and no infant was given non-breast milk at the hospitals. The mean birth weight was 3217 ± 383 g. The mean score of breastfeeding difficulties was 31.4 ± 8.5, ranging from 18 to 74. Severe breastfeeding difficulties were reported around 1.7% to 25.1% among mothers. Ten point one percent of mothers reported severe concerns about their insufficient breast milk. All mothers initiated breastfeeding in the hospital. The prevalence of receiving sugar water, water, herbal teas, and formula during the first month postpartum was 10.1%, 3.6%, 52.2%, and 8.6%, respectively. Around 7.7% of infants received both herbal tea and sugar water. At the end of first month, 33.1% of the babies were on EBF, 58.2% were on predominant breastfeeding, and 8.6% were on partial breastfeeding. Two infants died and 8 women stopped breastfeeding during the first 6 months postpartum. The overall mean and median of breastfeeding were 19 and 21 months, respectively. Breastfeeding survival rates for 6, 12, 18, 20, and 24 months were 97.7%, 93.8%, 86.5%, 76.8%, and 22.3%, respectively. Table 2 presented breastfeeding survival rates based on breastfeeding practices at the first month. The multinomial univariate logistic regression analyses revealed that breastfeeding difficulties (P = 0.02) and monthly household income (P = 0.007) were significantly associated with breastfeeding practices. Other variables associated with the outcome with P < 0.3 were age (P = 0.27), educational level (P = 0.07), occupation (P = 0.17), breastfeeding experience (P = 0.12), and type of delivery (P = 0.22). The multinomial multivariate logistic regression analysis was used to determine the final models. We assumed that there were interactions among 3 independent variables of having no breastfeeding experience, giving birth by cesarean and experiencing breastfeeding difficulties. Multinomial multivariate logistic regression analysis could not identify any interaction among these independent variables. Parameter estimates were presented in Table 3. Only breastfeeding experience was associated with predominant breastfeeding. Income, breastfeeding difficulties, and maternal age were predictors of partial breastfeeding. The multivariate Cox proportional hazards regression analysis estimated that hazard ratio of breastfeeding discontinuation for the predominant and partial breastfeeding groups were 1.11 (P = 0.49) and 2.23 (P = 0.001), respectively compared to the exclusive group. The hazard rates and their respective 95% confidence intervals were shown in Table 4.
aAbbreviations: CI, confidence interval; IRR, Iranian Rial and OR, odds ratio. bThe reference category is exclusive breastfeeding. cStatistical significance: P < 0.05.
dStatistical significance: P < 0.01.
aAbbreviations: CI, confidence interval; and IRR, Iranian Rial. cStatistical significance: P < 0.01. For comparing equality of breastfeeding survival distributions among different levels of variables, we used the log-rank test. Breastfeeding practices was the only variable with significant breastfeeding survival distributions for the 3 levels (Chi-square = 14.76, P = 0.001). Figure 1 presented the breastfeeding survival function according to breastfeeding practices. In the present study, we investigated the breastfeeding practices in the first month of the infants’ lives and the effect of these practices on breastfeeding duration at 2 years postpartum. Our results indicated that mothers discontinued EBF in the first month postpartum. This happened mainly due to the introduction of water-based fluids to more than 50% of the infants. Breastfeeding experience was the only factor found to be associated with this practice. The probability of introduction of water-based fluids (the predominant breastfeeding) for women without previous breastfeeding experience was 1.6 times more than women with such an experience. While a previous study in a western country indicated that having no breastfeeding experience is a risk factor for early discontinuation of breastfeeding (22), the present study showed that there was an association between being inexperienced and introducing sugar water or herbal teas in the first month postpartum. Younger mothers with no breastfeeding experience may be influenced by the opinion of their older relatives who believed that infant should be fed by sugar water and herbal tea to prevent or cure infant colic and jaundice (23). The result of another study found that breastfeeding experiences were associated with significantly longer breastfeeding duration (24). In addition, our results showed that family income was independently associated with partial breastfeeding in the first month postpartum. In recent years, free formula has not been given to mothers in primary health care centers in Iran and it seems that the relatively high infant formula prices is a barrier for introducing formula for some mothers, so that low family income had a protective effect on the introduction of formula. This result is in agreement with the result of a study in Quebec, which indicated that annual family income had a negative relationship with breastfeeding and EBF at 2 months (25). Results of another study revealed that paid work and family support influenced breastfeeding duration (26). Our results indicated that women who had breastfeeding difficulty were 2.8 times more probable to introduce formula than mothers who did not. In previous studies, breast engorgement was related to the introduction of formula in the first month of an infant’s life (13, 27). Since the presence of breastfeeding difficulties can lead to insufficient and infrequent breastfeeding, it is possible that the baby does not receive enough milk and mother forced to feed baby with formula. Also, we found that mothers older than 30 years, unlike young mothers were more likely to introduce formula in addition to breast milk to their infants. It may be due to their moderate autonomy with infant feeding that led them not to comply with breastfeeding guidelines. Result of a study showed that mothers with the lowest autonomy were more likely to breastfeed exclusively than mothers with moderate autonomy were (28). The present study showed an association between breastfeeding practices at the first month and the breastfeeding survival rates. The breastfeeding survival rate after 24 month among both exclusive (26.5%) and predominant breastfeeding mothers (21.7%) was significantly higher than partial breastfeeding group (8%), which is in agreement with the results of previous studies (13, 24, 29, 30). Other studies reported that the breastfeeding practices on the first day postpartum have an influence on breastfeeding duration (31-33). Similar results were achieved in a study by Haggkvist et al. (34) with supplementation during the first week of life with water, sugar water, or formula. In our study, the prevalence of the exclusive and predominant breastfeeding at the first month was 33.1% and 58.2%, respectively. Result of a prospective study in Isfahan showed that one month after the delivery, 93.1% of mothers were on exclusive breastfeeding (35). In a cross sectional study in Lebanon, the rate of BF initiation was high but EBF rate at 1 month dropped to 52.4% (36). Both studies used the 24-hour recall method to collect the data related to infant feeding. In contrast, there were studies that used recall of feeding practices since birth, which found lower rates of EBF. A cross sectional study by Vossenaar et al. showed that the rate of exclusive breastfeeding in Guatemalan women were 14% and 9% for 5 and 6 months, respectively. The corresponding figure for predominant breastfeeding was 33% and 23% (37). Also, in a study in Guatemala using recall of feeding practices since birth, exclusive breastfeeding and full breastfeeding rates were 9% and 31%, respectively (38). Similarly, in a study in Uganda using dietary recall since birth, the rate of exclusive breastfeeding by 3 and 6 months were 7% and 0%, respectively, while 30% and 3% of mothers practiced predominant breastfeeding (39). We asked mothers to recall what their babies had eaten during the month. In our study, there was no difference between the exclusive and predominant groups in terms of breastfeeding survival. Bahl et al. showed that the risks of death were similar for infants who were on predominant breastfeeding and those who were on exclusive breastfeeding during the first 6 months (40). Rasenack et al. showed that either introduction of sugar water or formula supplementation at the first day could affect the rate of breastfeeding longer than 6 months (33). In this study, 86% and 77% of women breastfed for 18 and 20 months, respectively and ceased breastfeeding at the expected time. This might be the reason we could not find any factor influencing breastfeeding survival except breastfeeding practices at the first month postpartum. We found that the mode of delivery and the psychological state of mother, which were the known predictors of breastfeeding cessation, were not associated with the partial or predominant breastfeeding during the first month postpartum. It was suggested that women who underwent cesareans or had low psychological well-being received adequate support after childbirth that could lessen the negative effects of a cesarean or low level of psychological well-being on breastfeeding. Additionally, it was possible that psychological state of mothers improved after childbirth. Findings of this study increased our knowledge about breastfeeding practices in the first month postpartum and its impact on breastfeeding survival rates in Shahroud and contributed to our understanding of factors associated with predominant and partial breastfeeding in this low risk population. We recommended that further studies be designed to assess the side effects of early introduction of water-based fluids on child’s health. Finally, we did not categorize partial breastfeeding into low, medium, and high as proposed by Labbok and Krasovec (16). With regard to high proportion of partial BF in this study, we recommend that the data regarding the partial and predominant breastfeeding be collected in detail in future studies in Iran. Considering the high rate of introduction of water-based fluids (58%) in the first month postpartum, it is clear that the problem calls for a comprehensive approach and devising policies to promote EBF rate in Shahroud. We found that the method of breastfeeding in the first month of a child’s life influenced the breastfeeding survival time. Mothers with low levels of income or those faced breastfeeding difficulty were more likely to introduce formula in the first month postpartum. In addition, mothers with no breastfeeding experience may feed their babies with water-based fluids and should be consulted in prenatal care about the benefits of EBF. Interventions to promote breastfeeding duration should focus on discouraging the introduction of formula, especially in mothers with high socioeconomic status. In addition, mothers who face any breastfeeding difficulty at the first days postpartum should be identified and helped. The first strength of this study was mothers’ enrollment in late pregnancy, which enabled us to assess the effect of psychological states on breastfeeding methods. The second one was the long follow up of breastfeeding. The third strength of this study was that we could generalize the results to all Shahroudi mothers, since the 10 healthcare centers covered the entire city and all pregnant mothers were registered to receive free infant vaccination. The possibility of recall bias is a limitation of this study, since mothers had to recall which fluids the baby received or when they stopped breastfeeding. However, previous studies showed that the proposed method of dietary assessment by WHO (the previous day dietary recall) overestimates the exclusive breastfeeding rate compared with recall of feeding practices since birth (38, 39). In addition, the low proportion of the partial breastfeeding group may affect the results of the regression analyses. The authors wish to thank all midwives and mothers who participated in this study. Authors’ Contributions: All authors have contributed significantly in the study. Forough Mortazavi was the main investigator who wrote the proposal, collected the data, and revised the final draft. Seyed Abbas Mousavi contributed to the study design. Reza Chaman contributed to the interpretation of the findings. Ahmad Khosravi contributed to the statistical analysis. Karen Ann Wambach was the creator of the BES. Saideh Sadat Mortazavi co-wrote the first draft and edited the final draft. Financial Disclosure: This work is part of a PhD dissertation entitled “assessment of breastfeeding attrition prediction tools in prediction of breastfeeding initiation and continuation” and was partially financed by Shahroud University of Medical Sciences (approval No: 9004).